Reviewing some naproxen information today, I’m reminded of the serious nature of getting the right gout cure for pain. But always remember that naproxen only helps relieve the pain of acute gout. 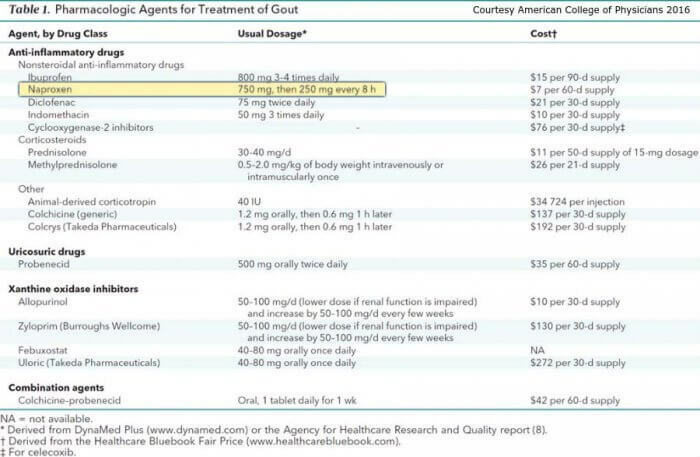 So you must also get uric acid treatment to stop gout permanently and remove the need for naproxen for gout pain. I remembered an important fact today that really needs to be considered if your doctor suggests steroid treatment. “But what has that to do with naproxen?” I hear you ask. Nothing directly, except that both act to relieve inflammation, and both are commonly prescribed for curing gout pain. Naproxen is a member of the family of drugs known as NSAIDs (Non-Steroidal Anti-Inflammatory Drugs). Ibuprofen and indomethacin are common alternative NSAIDs, both of which are common gout pain treatments. Now, this may be true from a pain control point of view, but the findings have provoked some controversy, reported in the medical press. The problem surrounds the diagnosis of gout. In most cases, gout is easy to diagnose, and confirmation by a painless analysis of joint fluid by a good rheumatologist is the current gold standard. Unfortunately, there are some diseases that have gout-like symptoms, so a poor diagnosis can be potentially dangerous. Septic arthritis might be present in a joint, which could be the sole cause of discomfort, or could exist alongside normal gout. If this is the case, steroids will do more harm than good. If you are in a situation where you are offered naproxen or steroids such as prednisone/prednisolone for gout, I recommend opting for the naproxen. You should at least discuss this with your doctor to make sure the chances of septic arthritis have been considered. Do you take the correct naproxen dosage for gout? Above all, you should organize uric acid treatment to get your level down to 5mg/dL (0.30mmol/L), or below. That way, after a few months detoxing, you can say goodbye to gout, and the need for NSAIDs or steroids. Title: Use of oral prednisolone or naproxen for the treatment of gout arthritis: a double-blind, randomised equivalence trial. Authors: Janssens HJ, Janssen M, van de Lisdonk EH, van Riel PL, van Weel C.
Published: Lancet. 2008 May 31;371(9627):1854-60.